Whether you choose our SIP Trunking Solutions or our business phone system (MyOffice PBX), IPComms lets you connect to our network using virtually any SIP compatible devices, regardless of where you might have purchased them. We support most popular IP gateway, Softswitch, and VoIP phone vendors such as Polycom™, Cisco™, Yealink™, Grandstream™ and even most SIP Softphone vendors like Xlite™, 3CX Phone™, and Zoiper™ to name a few. While we do sell VoIP phones and other devices, you are definitely not limited to just ours selection. You always have the freedom to bring your own phones or purchase phones directly from another VoIP hardware supplier. My of our customers even find great deals on used phones on Ebay, Amazon and other online stores and auction sites. While we can't warranty these phones not purchased directly from us, we can help assist you with getting them connected to our network. If you have questions about a phone you already own and want to test it with our network before purchasing, just give us a call, and we'll be happy to help you with your device setup. Remember our risk-free 30-day money back service guarantee is always there, so rest easy! 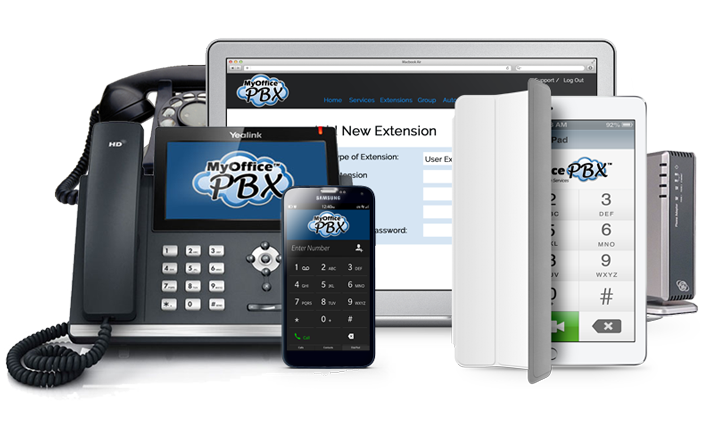 What PBX Features does MyOffice PBX support? Do you provide Inbound only SIP trunks?